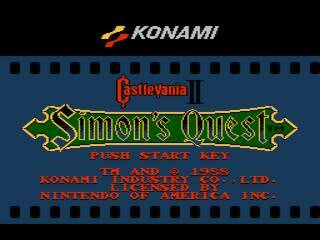 The second Castlevania game was released in December 1988 and has little in common with its predecessor. Linear gameplay is replaced by an RPG-ish world with towns, day & night, leveling up and using hearts to buy things. Simon Belmont was cursed by Dracula and must travel the land to find and burn his five remaining body parts. Some townsfolk along the way will help you, others will give you useless info, and others want you to die. If you take too long to finish the game, Simon dies in the ending, succumbing to the curse. Best time: Single-segment 0:38:42 by 'Furious Paul' on 2014-03-06. Best time with deaths: Single-segment 0:36:52 by 'Furious Paul' on 2014-01-31. Best 100% time with deaths: Single-segment 0:45:43 by 'Furious Paul' on 2014-01-14. Single-segment 0:38:42 by 'Furious Paul'. Deathless runs are very challenging to pull off in Castlevania II, and it usually takes me a number of attempts to get a deathless run in. The difference with deathless over any% is with any% you have to take a death to farm for hearts at the lizardmen to the left of the starting town of Jova, but that death/grind enables you to get the holy water AND the white crystal before the first nightfall enabling the player to be at the chain whip door the next morning. With deathless you have to grind safely at nighttime then purchase the white crystal the next morning. So, any% will always be 1:30 faster than deathless, because it takes the player a minute thirty to go from the white crystal to the chain whip door. Some interesting aspects of the deathless route I do involves buying the white crystal (the second morning of the game), then going all the way to the town of Aljiba to exchange it for the blue crystal before it turns nighttime (the crystal guy disappears at nighttime). This is a tough challenge to achieve, but it saves 3 minutes off the final time. In order to make this work, the player must get the floor drop (within 1.5 seconds) at the 6:06 minute mark along with doing everything else that morning almost perfectly. This is like a speed run test built into Simon's Quest that is very challenging to pull off. Another challenge with getting a fast deathless time in involves being at the morning star (whip) door before it turns nighttime (shops are closed at nighttime). In order to accomplish this you must be very quick outdoors until you get to that door. Mansions do not count as game time stops in them. This also means the player must get the second and third floor drop (around the 9 minute mark) within 20 seconds or it will turn nighttime right before you get to the morning star whip door. I also pulled off this run using NO laurels or churches. Laurels and churches are not needed in order to get a deathless run in, just good skill with some good luck is all that is needed. The only major mishap during this run is that it took me awhile to do the first floor drop in Death's Mansion at the 20 minute mark. That is where most of my time could be saved with this run. I fully intend to improve on this run in the future. Single-segment with deaths: 0:36:52 by 'Furious Paul'. Brahm's Mansion (or Death's Mansion), is the hardest mansion in the game, especially for speed running. There are many tough glitches to pull off and many random enemies to deal with. I've lost MANY runs in that mansion. There is two ways to fight Dracula during a speedrun. 1st and easiest method is to use the golden dagger on him 6 times. 2nd method which requires simply whipping him. Whipping requires way more skill and is a lot harder to pull off. Whipping 100% correctly is 2 seconds faster though! If you are first getting into Castlevania II and would like to follow one of these speed runs to use as a guide, then I recommend following the 100% run, as that is probably the easiest to follow as a casual player. You can skip on buying the regular dagger (in the town of Veros), to save on hearts if you like. Same thing with buying the garlic and getting the silver knife (in the town of Aljiba), as these are unnecessary to beat the game with. The chain whip is one of the best purchases you can make early on, so I would try to get that for sure. You can skip on going out of the way to get the diamond and silk bag as well, as these items are not needed to beat the game. The sacred flame is an easy grab and can help you out numerous times throughout the game, including using it to kill Dracula with. You can try the floor drops if you like, but some players may have serious issues pulling them off. Floor Drops - I have to pull off 5-7 floor drops hopefully within 10 seconds a piece. Floor drops are a glitch in the game that is a frame perfect move that allows Simon to actually drop through the floor. This can only be done in places where there is exactly a 2 block height underneath Simon. Floor drops are not fully understood, but I think they are frame perfect. I consider them 70% skill and 30% luck. I've noticed I slowly got better at them overtime. Killing Death instantly with holy water - Death is the hardest battle in the game. He is pretty much the "boss" of this game for speedrunning. I have to pull off a pixel perfect move on him with the holy water and if I don't do it in time Death may corner and kill me. My current success rate with a quick successful Death kill is only about 50% of the time. I think you have to land the holy water on the edge of the hitbox of Death and the ground at the same time. I could be wrong, but that's usually the case it seems when it works. If done right, he will instantly vanish. Purple Block Trick - In Rover Mansion (heart mansion), close to the stake merchant, there is two purple blocks that go back and forth. If you jump at these from above at a certain time, those purple blocks will push you into a glitched out version of a section in Camilla's mansion. In that glitched out mansion, there are two exits, one that takes you out of the heart mansion, and another one that takes you to the top of the heart mansion. I utilize both of these shortcuts, which cuts out 25 seconds of the final time. Clipping through walls - There are various spots in the game that Simon can clip through a wall (not a floor drop). There is 4 that has been discovered so far. There is one at the top of Death's mansion (this is currently only shown in the Deathless run). One after obtaining the flame whip, and two at the water passages where Simon whip jumps upwards bypassing the steps. Heart drops are random and become a serious issue in both the Any% and Deathless runs. The 100% run does not have any heart luck issues thanks to the full grind the second night. The Pikemen Knights are random in the way they move back and forth. They can change velocity at any given second and turn direction at any given second too. This can be devastating in any run. Slimes (or blobs as I call them) jump at set times, but where they jump is random. Gargolyes are similar to the Pikemen, in which they can change directions at any given time, and they jump randomly as well. Floor drops have some randomness to them, as it can take awhile to pull them off. I have been a speed runner since 1995. I got started with Doom 1/2, Quake 1, and in 1999 I started speed running Castlevania 4. From 2005 - 2008 I was speed running World of Warcraft under the name Joana (female characters), or Mancow (male characters). I also speed ran the single player campaign of Starcraft II Wings of Liberty. From 2009 - 2012 I was heavily into playing Trials HD/Evolution. Castlevania II is the first runs I have submitted to the SDA. The Any% run involves beating the game as fast as possible using any means necessary. With Castlevania II, this involves utilizing deaths and glitches to my advantage. The Any% run involves farming for hearts at the left of the starting town of Jova at the lizardmen for the first part of the run. This grind enables the player to buy both the white crystal and the holy water before nightfall, enabling the player to be at the chain whip door the next morning. This saves minutes off the final time. The drawback is that you must take a death. My goal with this run was to only do it with one death at the lizardmen grind at the start of the game, but I did die a second time accidentally near the end of the game in the cemetery. I fully intend to improve on this time in the future and get it down to only one death. Single-segment 100% with deaths: 0:45:43 by 'Furious Paul'. The 100% category is actually my favorite category to run in Castlevania II and that is because of much less resets. I can get a game in much easier and RNG hearts rarely become an issue in the 100% run. Plus there is more gameplay involved. In addition to all the other items I get in the game, the 100% category also involves getting a regular dagger, sacred flame, silver knife, diamond, and a silk bag. I also show these items off as much as possible throughout the run. I have also found many speed run uses for these items as well, including actual uses for the diamond and many uses for the regular dagger! The diamond is shown off in Death's mansion (Brahm's Mansion). Since this run involves more hearts in order to buy additional items (dagger and garlic), there is more farming for hearts involved. In fact the first two nights I grind on green zombies in order get these hearts. I admit this is boring to watch, but once that is over everything else is cool to watch. You will notice the game starts off using a laurel. This is because with the previous game I played, I used a laurel right at the end of the Dracula fight on purpose just so it will start the next game off with it. This is a small glitch in the game. This has no gameplay advantage, just interesting to see. When entering Berkeley Mansion (rib mansion), you will notice I jump quickly onto an invisible platform. Apparently you can still jump on that moving platform even if you do not equip the crystal, you just cannot see it. I died twice during this run. I died on purpose in Brahm's Mansion before the Death fight at spikes so I will have full health at him. The second death was at the blob section before buying the Morning Star Whip. I think this run can be done with only one death, but it's tough. I plan on doing that sometime in the future. A deathless 100% run is something I will consider, but you will need to buy laurels, which will eat up more time.